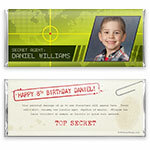 Celebrate the little spy in your life with this fun and cool secret agent candy wrapper. Design: Secret agent map with tracker, photo and tech banner. Personalization: Front photo and name, back title and message. Recommended Photo Size: 666 W x 525 H pixels.